Lace Align™ Lumbar Orthoses are designed to help stabilize and decompress the spine in patients recovering from surgery or injury. Rigid anterior and posterior panels limit flexion and extension and help protect and support the vertebrae and surrounding tissues. Slide-to-adjust sizing feature significantly reduces inventory requirements with only two sizes needed to fit the majority of patients. This innovative design incorporates Outlast®, a hi-tech fabric that provides proactive temperature regulation to help manage heat and moisture beneath the brace for all-day comfort. 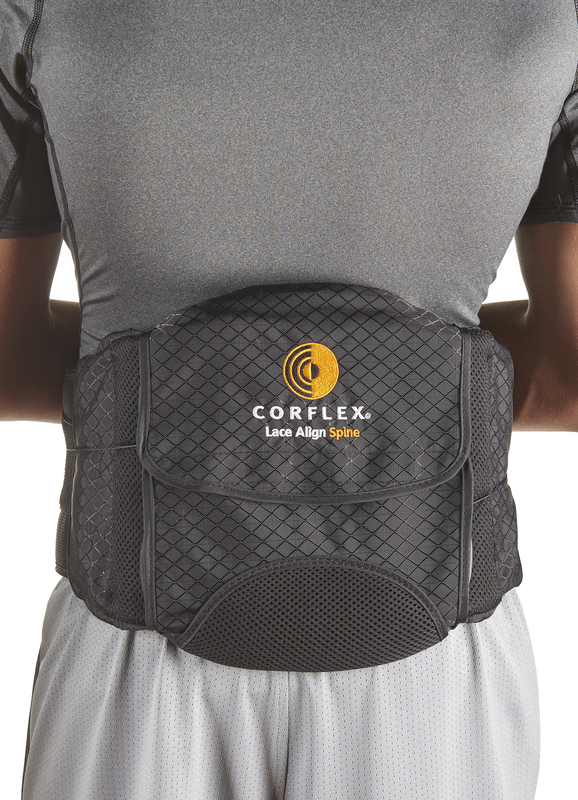 Removable back panel allows brace to easily “step down” to a traditional back brace, offering moderate support and increased customer value. Optional Gel Pouch (sold separately) attaches easily and delivers hot or cold therapy following surgery, injection or injury. 30" - 45" 40" - 60"
Measurement taken from waist or hip circumference. Use the larger of the two circumferences when selecting brace size. Add the Extension Kit to L/XL when fitting patient's with a waist/hip circumference from 60" to 75".